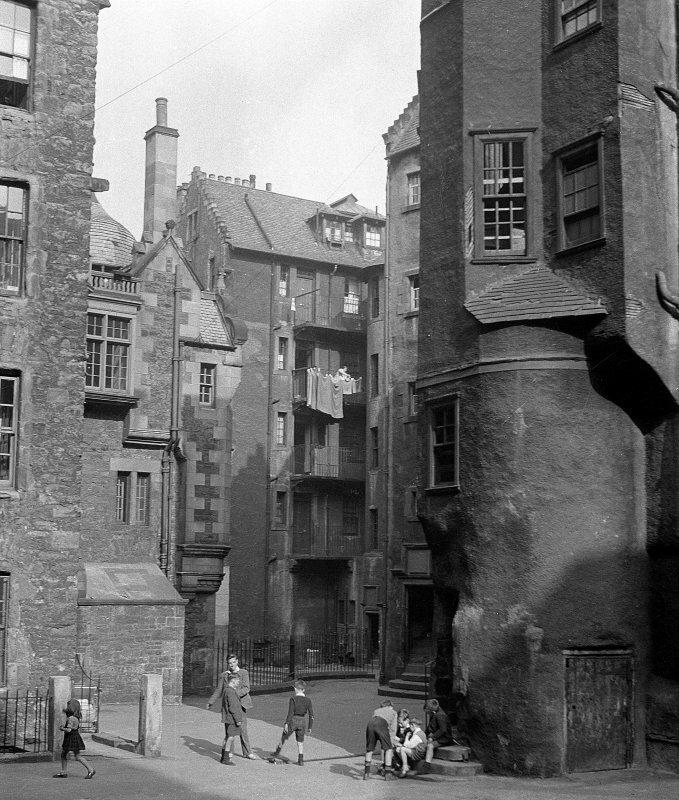 General view of rear of Baxter's Close and Lady Stair's Close, Edinburgh, with children in foreground. Baxters Close was one of four closes named for the property of the Incorporation of Baxters (i.e. Bakers) which stood some 200 feet North of the High Street on a site now occupied by North Bank Street. It is listed as Upper Baxter's Close on Edgar 1742 and as Old Baxter's Close on Ainslie 1780, and is famous as being where Robert Burns lodged on his first visit to Edinburgh in 1786. It was also known as Hooper's Close, from a family named Hooper (or Hopper or Happer) who held property in it before 1723. It also seems to have been one of the four closes in Edinburgh named Bull's Close for Robert Bull, deacon of the Wrights in 1680, who sold property "on the North side of the High Street" to David Hopper, one of the family who owned a tenement in the close.